Continuing the Long Island City build-em-up shuffle, a new 12-story development is planned for 41-22 24th Street. Located between 41st Avenue and Queens Plaza North, the 87-unit project will be designed by MY Architect PC, according to the plan exam application filed October 2nd. The building will include bicycle storage, parking and an open roof terrace, as well as 66,525 square feet of residential space. The property traded in 2012 for $2.575 million. The developer is 41-18th 24th Street LLC, created by Sina Mahfar of SMA Equities. Demolition permits were filed in May for the existing one-story warehouse on the lot. 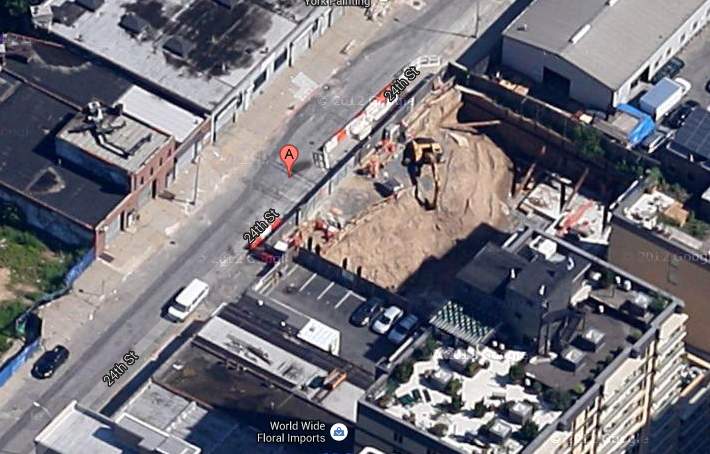 41-22 24th will be down the block from a 421-unit luxury rental by The World-Wide Group at 41-50 24th Street. The 21-story tower will be the first non-Manhattan residential building by The World-Wide Group in 10 years, Crain’s reported. The firm bought the 41-50 24th Street site in 2012 for $28.9 million. The finished $157 million project will offer studios to three-bedrooms.